Planning and Scheduling Training Materials are designed for developing supervisors’ and managers’ ability to effectively plan and schedule. Teach your management the work breakdown structure, identify task dependencies, how to align resources with activities, project planning and much more! Seeing is Believing This sample manual to teach Planning and Scheduling is in MS Word format. Have you had employees asking you about effective planning skills and project management, or wondering what's so important about having scheduler training? Knowing how to tackle the big projects is an important skill for any professional, especially those in charge! Effective scheduling management helps bring visions to life without being overwhelmed by all of the things that have to get done. 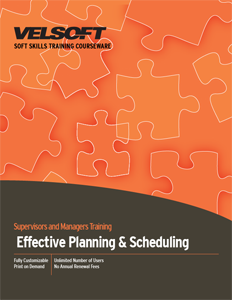 Velsoft's Effective Planning and Scheduling Training Material comes with a fully customizable instructor's guide, pre- and post-course assessments, and examples to help teach the benefits and importance of project scheduling. Employees learn how to break down projects into more manageable tasks to get things done, as well as how to estimate project duration, resource allocation, risk planning, communication, as well as which software can most help them out, and more! By the end of this course, students will be prepared to create a sustainable project schedule, and be able to update and monitor its progress in the workplace. Trainers can also combine their courseware with Velsoft's eLearning website and create a blended learning environment that extends their training into the workplace.